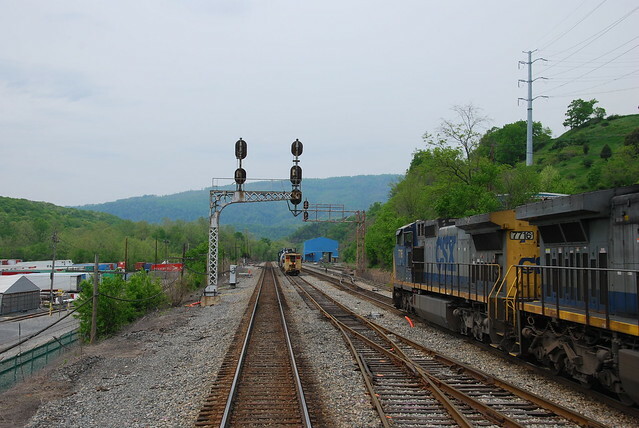 This page takes a look back at the C&O signals that have been replaced along the CSX Alleghany Subdivision between Clifton Forge, VA and Hinton, WV. 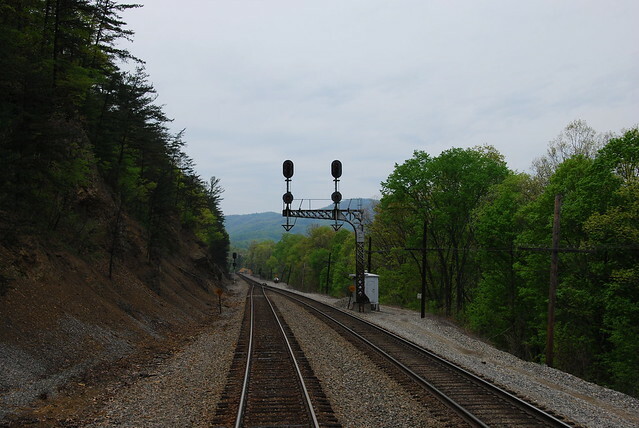 Signal forces began working in the Clifton Forge area in the fall of 2010 and have replaced all the signals between JD Cabin and Tuckahoe as of December 2011. In 2012 crews began working their way west from Hinton to Alderson. This page will be updated as work progresses. If you have any material you'd like to contribute, please contact me at jl.hawkins@comcast.net. A Buckingham Branch local awaits departure from Clifton Forge on an extremely humid morning. The clear signal being displayed on the pole signal for No. 2 track is for an eastbound CSX sulfur train. The short signal on the far right controls movement from the "Selma Lead" which the train is occupying. A Safetran cantilever signal bridge now stands in this location. Looking at the Jackson River signals in Clifton Forge. While the eastbound signals (seen above) were mounted on a cantilever signal bridge, the westbound signals consisted of a pole signal and a dwarf that were on the opposite side of the bridge. This photo was shot from the old Selma bridge which has since been torn down. Unfortunately the new bridge has a debris fence which makes photography from it difficult. The tall, white structure above the bridge is an elevator shaft that was used to transport railroad employees from street level to an underground passageway that led to the shop complex. Visible just above the coal train in the right side of the frame are locomotives at the modern fueling facility constructed in 1996. At the western end of Clifton Forge Yard is hamlet of Low Moor. The cantilever signals along with a pole signal were removed from service in early 2011. Also take note of the cast iron yard limit sign at the base of the cantilever signal. This was and still is the westbound distant signal to the beginning of the double track mainline in Covington. 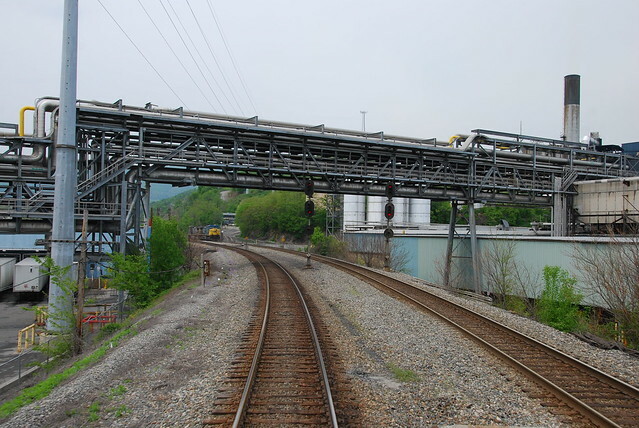 The photo above is looking west and shows the new Safetrans installation which has since replaced it's C&O predecessors visible in the distance. Situated in the heart of Covington is the interlocking at Chestnut Street. The white plumes in the background are being emitted from the Westvaco paper mill. The cantilevers were removed from service on July 26, 2011. Note the maintenance of way buildings next to the distant cantilever. These date to the C&O era and are similar to those found at White Sulphur Springs, WV. This interlocking is aptly named "Paper Mill" due to it's location in the heart of Westvaco's facility in Covington. The photos above show the eastbound (top) and westbound (bottom) signals. Note the unusual (by C&O standards) cantilever signal on the right side of the tracks in the bottom photo. Paper Mill was the east end of a middle siding that stretched over two miles westward to BS Cabin. The area to the left of the tracks in the bottom photo was once the location of the West Virginia Pulp and Paper Company's country club. The C&O maintained an 8,800' center siding between Covington and BS Cabin. The BS designation was the telegraph code for the cabin here and is derived from the nearby Boys' Home. A steel water tank was also once located here that supplied a water column between the westbound main and the siding. The water tank survived into the 21st Century but was torn down in recent years. Nestled in the Alleghany Mountains some 17 miles west of Clifton Forge is the hamlet of Callaghan. Once boasting it's own passenger station, the Callaghan area is today just another dot on the map. In this October 2010 photo the signal bridge at Callaghan was still very much active and work had yet to begin on it's replacement which is now located approximately where the photographer is standing. Located in the hillside community of Moss Run, the railroad identifies the west end of double track here as OX Cabin. The cabin itself was a standard 2-story C&O wooden frame structure which stood in the southeast quadrant of the grade crossing at Moss Run and was torn down in the 1940's. Along with the cabin, this location was also the east end of a center siding during much of the C&O era. Prior to the C&O removing the double track between OX and East Alleghany, OX was also the location of a crossover. Moss Run is considered hallowed ground by diehard C&O fans and has long been a popular spot for railfans. Incidentally, the berm which serves as a popular vantage point for photographers once held a runaway track, but that was removed in the early part of the 20th Century. 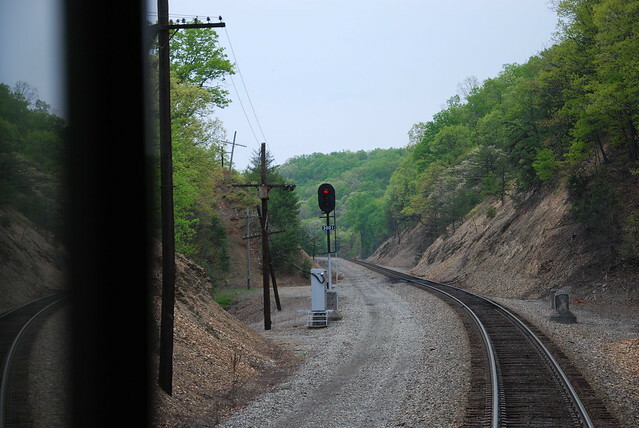 The photo above was taking with a telephoto lens from the grade crossing at Moss Run. It shows the westbound signal for No. 1 track displaying an approaching indication for Amtrak 51, the westbound Cardinal. Photo 1 - C&O GP9 No. 5939 leads westbound empties up 1.13% grade past OX Cabin sign at Moss Run in September 1958. Photo by Gene Huddleston. Photo 2 - OX Cabin in 1915. During the era when this stretch of railroad was double tracked, Backbone was the location of a signal bridge that spanned the mainline. The concrete bases for the old signal bridge can easily be seen in the bottom photo which was taken from the rear of Amtrak's Cardinal. The pole signal shown above was removed from service on December 10, 2011. Another casualty of the signal changeover on December 10, 2011 was the signal at Jerry's Run. The photos above are looking east and west respectively. Approximately one mile east of A Cabin is the east end of 19 miles of double track mainline which stretches westward to WR Cabin near Ronceverte. 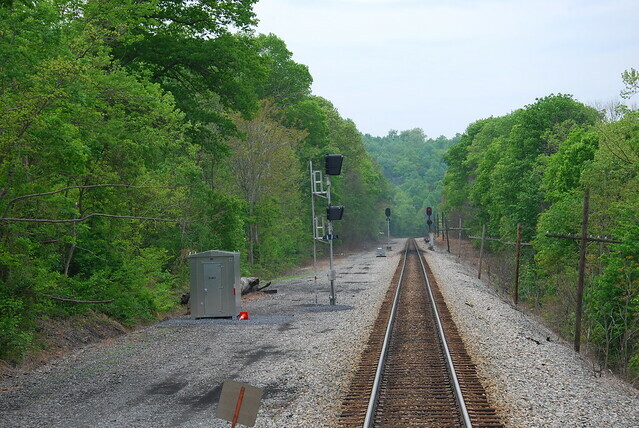 Appropriately called East Alleghany, the mainline between here and OX Cabin now consists of a single main track after the C&O removed the second track in the early 1970's. Just out of view around the curve in this photo is the west portal of Lewis Tunnel. 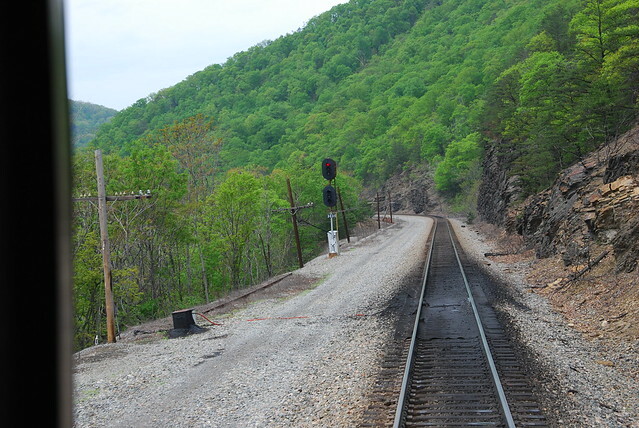 The C&O signals at East Alleghany were deactivated on December 10, 2011. One of the more well-known cabins on the C&O was A Cabin at Alleghany, Virginia. This brick structure was built in the early 1930's and replaced a wooden tower constructed in 1895. The A Cabin operator was responsible for the five miles of railroad between Lake's Tunnel and Tuckahoe. A Cabin was closed in 1961. This cantilever signal bridge at A Cabin is an exception to the recent signal replacement project. In this 2005 photograph the signal heads are turned as they have been since the late 1990's when the installation was deactivated. The entire signal structure was removed in June 2007 and only the concrete base remains today. The open area between the signal bridge and the mainline was a siding that extended from just behind the photographer to East Alleghany. Visible on the far side of A Cabin are a pair of C&O maintenance of way sheds. Unfortunately they were both demolished in 2008. Just across the Eastern Continental Divide and state line from A Cabin is Tuckahoe. Situated at milepost 308, Tuckahoe was the east end of a middle siding in the C&O's heyday.